If you’ve ever felt out of control in your life, you’re not alone. Countless people feel at a loss as to why their emotions seem to spiral out of control, or why they are bursting with creativity in one moment and slunced over with ennui the next. The key to these problems lies in sound waves at such low frequencies you don’t even notice them which can alter your state of mind and frame of consciousness. To counter these effects, the Unexplainable Store offers isochronic audio brainwave stimulation and isochronic crystal activation to help you take control of your state of mind, whether to increase your health, cleanse your chakras, or unleash your creativity. If you’ve never heard of isochronic brainwave stimulation or binaural beats, you’re in for a treat. Audio stimulation activates the your brainwaves, using the power of music to alter your state of mind and unleash the potentialities you want for any given situation. Low tones–so low they’re nearly inaudible–are played at a frequency beneath 20 hz. The frequency and decibel of these sound waves stimulates the neurons in your brain in different ways. By controlling this stimuli, you control your state of mind. 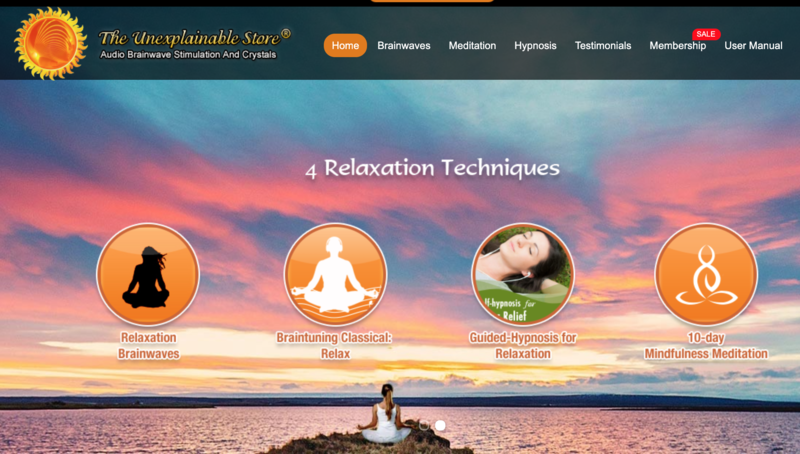 The Unexplainable Store also offers guided meditations and audio hypnosis, which make use of brainwave technology but also draw on years of study in meditation and hypnosis to help you tackle some of the hardest issues in your life. The effects of crystals in achieving certain states of mind has been studied for years. The Crystals sold on the Unexplainable Store have been cleansed of negative energy and lie open and ready to amplify the effects of isochronic stimulation. The Unexplainable Store sells individual audio tracks in a number of categories, helping you control various aspects of your life. The audio tracks vary from isochronic brainwave stimulation to guided meditations and hypnosis. Each is available as an MP3 download, but CDs can also be purchased, making for great gift ideas for others. In addition to the MP3 files available, the Unexplainable Store also offers numerous crystals, each with distinct properties to help you take control of your energy and your state of mind. The Unexplainable Store is perfect for anyone who wants to gain a better understanding of their mind-body connection. The Unexplainable Store has a vast array of downloadable material as well as purchasable crystals. Each of their products can be beneficial alone or in conjunction with their other products. One of the most exciting aspects of the site is the availability to download tracks individually or to gain access to the entire library with a monthly subscription. This is a feature we’ve missed on other sites offering similar products and it really puts Unexplainable Store over the top. Similarly, crystals can be purchased individually or in sets tailored towards specific goals such as weight loss or astral projection. We’ve looked and looked for a downside to the products offered on this site and haven’t been able to find any. The Unexplainable Store is well-thought-out and is put together perfectly. It’s easy to navigate, trustworthy, and offers a wide variety of useful products. There are numerous health and spiritual benefits to the products offered on the site. The relationship between physical and mental health has been known for thousands of years, and it is upon this relationship that Unexplainable Store products draw. They reach towards the mind, strengthening it and exercising it so that it, in turn, can improve circulation, burn fat, relieve stress, and boost the immune system. Most of the downloadable audio files are between ten minutes to an hour in length. This is enough time for the user to receive the benefit of the isochronic tones, but not so long that listening becomes a chore or an unattainable goal. The subscription to the website is available in month-long increments. Many of the studies on binaural beats and meditation show its success with pain and mood management. Hypnosis, on the other hand, has been studied in relation to addiction management and habit changing. The combination of all three of these unique practices ensures life-altering benefits are only a subscription away. Prices of individual audio files vary. Crystal packages cost $24 each and include sets of crystals as well as an MP3 to play along with them. The subscription plan with access to the entire library of MP3s is only $9/month. This is less than the cost of a Hulu or Netflix subscription and opens up access to an entire library of healing music.